The Battle of the Bulge, also known as the Ardennes Offensive was a last ditch effort by the Germans to split the Allied lines, and by doing enough damage hopefully force the Western Allies into a peace treaty. The battle lasted almost a month, from Dec. 16, 1945, to January 25, 1945. 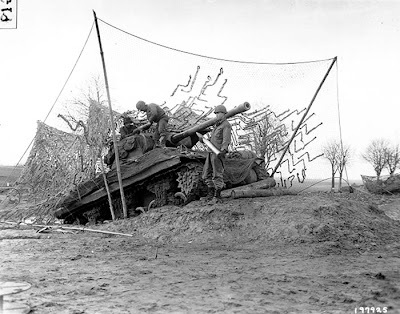 The battle got its nickname "Battle of the Bulge", from the appearance that the German advances made in the appearance of the Allied line, when looking at a map (the German advances made a sudden bulge in the line). Although the Germans had initial success, the Allies very stubbornly defended their positions, and when improving weather finally allowed air support to bomb German positions and supply lines, the German offensive finally was defeated. The cost in human lives was very high for both sides, but the victory for the Allies proved to be pivotal in their ultimate victory over Hitler and his Army. The U.S. had over 19,000 killed in action during the Battle of the Bulge, and the U.K. had over 1,400 killed in action. 2nd Armored Division, tank destroyer on dug-in ramp, Dec. 16, 1944. Members of the 7th Armored Division, take position along a road to St. Vith. Member of the U.S. Infantry in white camouflage, near St. Vith. Civilians flee the town of Bastogne, 1944. Bastogne was held by the 101st Airborne, and part of the 10th Armored Div., who stubbornly refused to surrender to the advancing German forces. This photo shows the Pathfinder unit of the 101st Airborne Division, who were setting up radar to help guide planes who would drop badly needed medical supplies and ammunition to the surrounded Americans. Members of the 4th Armored Division, fire at German troops as they advance towards Bastogne, to relieve airborne troops. Two soldiers carry the body of a fellow American, near Malmedy, Belgium. Many American prisoners were murdered in the area of Malmedy. The killings would be known as the Malmedy massacre. Remains of victims of the Malmedy massacre. The battle of the Bulge was the bloodiest battle that the U.S. encountered in WWII. They had over 19,000 killed. British forces lost over 14,000.